William Pynchon, earliest colonial ancestor of the novelist Thomas Pynchon, was a key figure in the early settlement of New England. He also wrote a book which became, at the hands of the Puritans it riled against, one of the first to be banned and burned on American soil. Daniel Crown explores. 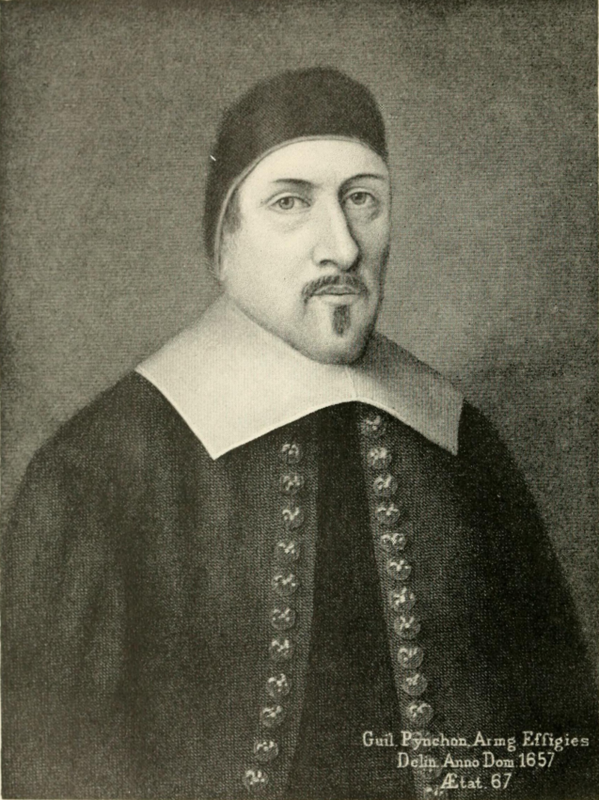 Portrait of William Pynchon, featured as the frontispiece to The Puritan in England and New England (1896) by Ezra Hoyt Byington – Source. “Derogatory!” the Court had called the book the previous day. Pithy denunciations, certainly, but ones with both immediate and lasting ramifications. Indeed, The Meritorious Price, written by the earliest colonial ancestor of the novelist Thomas Pynchon, had the lifespan of a Boston mayfly. A London publisher issued the first and only edition of the “small quarto volume of a hundred and fifty-eight pages” early in 1650.3 It made its way to Boston by summer. Mere months later, the book’s detractors had all but wiped it out of existence. What the Boston executioner had started, general disinterest finished with aplomb over the ensuing centuries. Only four copies of the book remain extant. The Meritorious Price, of course, reads today harmlessly enough. Truth be told, a modern reader need only fear boredom from Pynchon’s exegesis on the origins of Grace. To leading officials in the government of Massachusetts Bay, however, this was an insidious text, an exercise in heresy—one the Puritan clergy believed capable of throwing their young and vulnerable colony into irreversible chaos. Pynchon, a prominent layman with a devoted constituency, was charismatic enough to inspire a movement similar to the Antinomian debacle that had nearly brought the colony to its knees in the previous decade. Notwithstanding his lofty place in New England society, Pynchon and his book simply had to go. The ensuing controversy, placed within the context of Pynchon’s life, perfectly encapsulates the tenuous relationship between colonial New England’s people, its Church, and its State. Detail from a mural created in 1937 by Umberto Romano for the walls of the Springfield Main Post Office, now the Commonwealth of Massachusetts State Office Building. This particular panel is entitled Mr. Pynchon and the Settling of Springfield. Note the man to the bottom right gazing at what looks to be some kind of smartphone device – Source (NB: Not public domain). In many ways, William Pynchon is the forgotten founding father of colonial New England. Though largely unheralded today, there is no refuting he had his hands all over the enterprise from its very inception. Born around 1590, Pynchon came from an old and prestigious family. 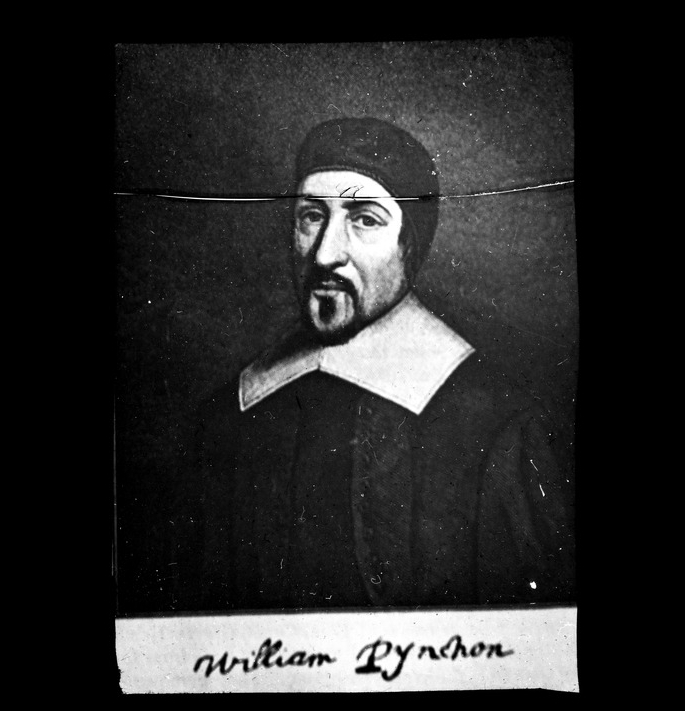 He owned a sizable amount of land in Springfield, Essex, where he served as a churchwarden — a lay position, typically held by prominent parishioners, which represented the laity at official meetings of the Anglican Church.4 It is unknown when Pynchon began to associate with Puritans, though it is widely held that by the 1610s he had befriended numerous influential reformers5, more than a few of whom advocated removal to America. Soon after arriving in 1630, Pynchon helped found and govern a settlement at Rocksbury—now Roxbury, Massachusetts. On May 14, 1636, he, along with a handful of pioneering Puritans, abandoned the colony to establish the Plantation of Agawam. From the start, he served there as a magistrate, overseeing local disputes and legal matters. Four years before the publication of The Meritorious Price, seven members of the Plymouth Colony took a public stand against the Bay colony’s stranglehold on local politics. Though New England’s Church and State remained technically separate, only members of the predominate Puritan churches were eligible for governmental positions.8 This stripped many members of the colonial community — particularly Presbyterians — of any sense of agency in their home colonies. Not only did these men, all of them English citizens, have to pay taxes to support Puritan ministers with whom they fundamentally disagreed, but they were also forced to agree to restrictive citizenship regulations, which they believed blatantly defied English law.9 In response to this, Robert Child and six others presented the General Court with a Remonstrance and Petition in 1646. For obvious reasons, Pynchon’s criticism of the colonial government proved immediately controversial. His true troubles began, however, the moment he turned his attention to the failings of the Massachusetts clergy. 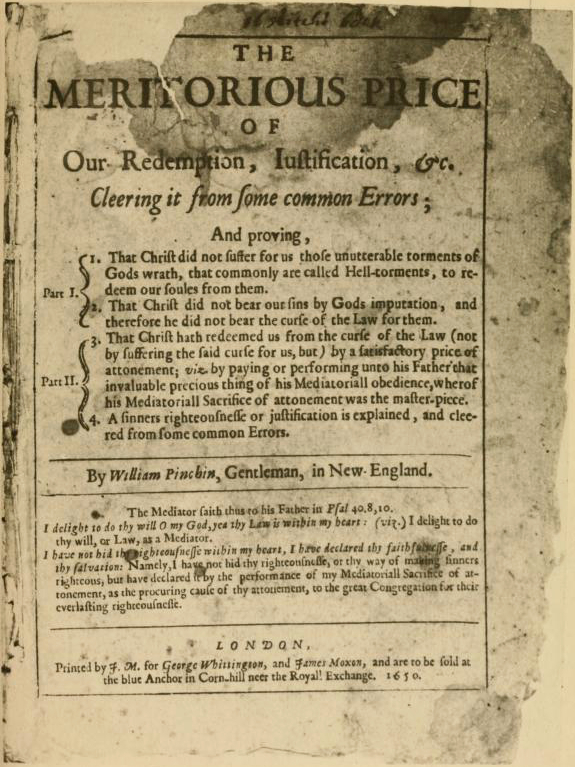 Title page to William Pynchon’s The Meritorious Price of Our Redemption (1650) – Source. The Meritorious Price of Redemption, Justification, &c., Cleering from Some common Errors; And proving: 1. That Christ did not suffer for us those unutterable torments of God’s wrath, that commonly are called Hell-torments, to redeem our soules from them. 2. That Christ did not bear our sins by Gods imputation, and therefore he did not bear the curse of the Law for them. 3. That Christ hath redeemed us from the curse of Law (not by suffering the said curse for us, but by a satisfactory price of attonement; viz. by paying or performing unto his Father that invaluable precious thing of his Mediatroiall obedience, whereof his Mediatoriall Sacrifice of attonement was the master-piece. 4. A sinners righousnesse or justification is explained, and cleared from some common errors. It is likely, then, the Court did not read the entirety of Pynchon’s book before having it burned. In their eyes, its opening pages were rife enough with heresy to merit immediate action. With this in mind, the Court ensured the aforementioned ship left Massachusetts without The Meritorious Price. Instead, it sent a letter of repudiation. In it, the Court did not merely rebuke Pynchon; they committed to paper a wholesale abjuration of the controversial conversations then occurring within the native Anglican Church and its growingly abundant offshoots. Old England had let its ecclesiastical leash go slack. New England would not make the same mistake. 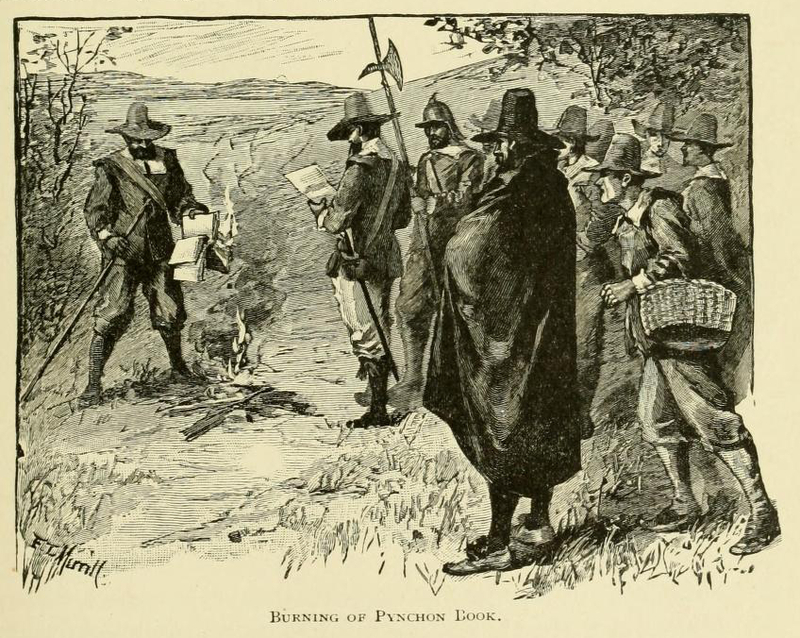 Illustration showing the burning of Pynchon’s book, from The History of Springfield in Massachusetts, for the Young (1921) by Charles H. Barrows – Source. To understand why, exactly, the Court reacted this way, one cannot avoid diving headlong into the debates that largely defined mid-17th-century Puritanism. Puritans of the era, both in the homeland and the colonies, lived and worked within an at times suffocating paradox. One of the major draws to the faith involved its emphasis on a personal relationship with the Bible. The Puritan clergy, then, had to figure out a way to encourage people of the faith to read the text without reading too much into it. While the Church taught and promoted very specific interpretations of scripture — particularly those defending the tenets of predestination — this did little to satiate the most curious and defiant in their ranks. As more and more fringe theologians grew in prominence, new and controversial exegeses soon proliferated across the Atlantic community. Given that England was currently winding up a ten-year civil war — one caused at least in part by controversial doctrinal issues — the colonial clergy was perhaps justifiably sensitive to what it deemed divisive ideas and innovations. None of Pynchon’s arguments, after all, were new. Pynchon admitted as much in future works. Wotton and Broughton, Pynchon’s greatest influences, both promoted similar theologies years earlier; yet, thanks in large part to their professional status, neither saw their respective books summarily rejected as did the founder of Springfield. Though a prominent member of Massachusetts’ society, Pynchon was nonetheless a theological layman. When he published his work, he crossed a line. Cracked lantern slide depicting a portrait of William Pynchon – Source: Thomas Crane Public Library (CC BY-ND). In addition to the burning of Pynchon’s book, the General Court also commissioned a theologian named John Norton to write an official rebuttal. They then summoned Pynchon to appear before the General Court in May 1651.16 There Pynchon offered the Court a half-hearted apology. “I have not spoken in my book,” he relented, “so fully of the price, and merit of [Christ’s] sufferings as I should have done”.17 The General Court accepted the man’s contrition, though the magistrates did demand he appear before them again the following October. They set bail at £100. This time, Pynchon absconded. In the end, Pynchon’s ideas about imputation and atonement never gained much traction. For all of its failures as a theological text, however, The Meritorious Price did live on, if only in the shadows of America’s earliest self-spun history. From the early-19th century onward, historical societies began to use Pynchon’s text as a literal and figurative footnote — often referencing The Meritorious Price as America’s “first banned book”. It is also worth noting that Pynchon’s equally enigmatic descendent, Thomas, has brought occasional attention to the book over the past five decades, making multiple references to his family history in his short stories, as well as in his classic novel Gravity’s Rainbow. This is not, however, to say that the impact of The Meritorious Price was entirely limited to future eras. In the decades following William’s death, the New England clergy’s staunch defense of restrictive church membership eventually softened as new and evolving viewpoints among the laity threatened to damn their church into irrelevancy. Though there is no direct link between Pynchon’s work and this radical shift in the colonial paradigm, historians have recently elucidated the fact that the father of Solomon Stoddard, one of the key figures in the reformation of the Church’s membership policy, once went to prison for his support of Pynchon’s book. This gives “the strong indication” that The Meritorious Price and Stoddard’s important innovations “grew from the same New England roots”.20 If so, then this stands as yet one more important facet of Pynchon’s lost legacy — a record paradoxically consumed and invigorated within the cleansing light of the executioner’s flame. The Meritorious Price of our Redemption (1650), by William Pynchon. Records of the Governor and Company of the Massachusetts Bay in New England (1854), edited by Nathaniel B. Shurtleff. The Puritan in England and New England (1896), by Ezra Hoyt Byington. The First Century of the History of Springfield; the Official Records from 1636 to 1736 (1898/9), edited by Henry M. Burt. The History of Springfield in Massachusetts, for the Young (1921), by Charles H. Barrows. The first book-length biography of William Pynchon, earliest colonial ancestor of renowned novelist Thomas Pynchon, and key figure in the early history of New England. Collecting twenty years’ worth of the best essays from historian Philip F. Gura, this book offers a fascinating snapshot of American history, from the explorations of early colonial beginnings to the early music trade of the 19th-century. Reprint of Morgan’s classic work from 1963, exploring the Puritan idea and how it manifested itself in the early history of America, focusing on the central issue of church membership.